Marking the film debut of Henson Alternative, a banner of The Jim Henson Company that specialises in adult content, The Happytime Murders is a puppet-based black comedy which definitely isn’t for kids. Based in a world where puppets and humans co-exist, the plot centres on puppet ex-detective-now-private-investigator Phil Phillips (Bill Barretta) trying to solve a recent murder spree of retired puppet sitcom stars, and being caught up in the police investigation of the crimes, alongside his – now ex – partner, human LAPD Detective Connie Edwards (Melissa McCarthy). Phillips and Edwards are enemies: twelve years ago, Phillips missed a shot when firing at a puppet criminal who was holding Edwards gunpoint, and ending up killing an innocent puppet in front of his young daughter. Edwards sustained an almost-fatal gunshot wound from the criminal and as a result, testified against Phillips, getting him thrown off the force, with a law put in place to prevent puppets from being cops. Forced together through the investigation of “The Happytime Gang” murders, there is no love lost between these ex-partners, but when things begin to look like Phillips is being framed, they have to put aside their differences and work towards finding the truth behind the crimes. The set up is pretty standard for buddy-cop movies, with a not particularly challenging story, and some plot holes easily poked at. Its weakness is that there are few surprises: you pretty much know how it’s going to turn out (though not, perhaps, guess the villain that easily), and there are no spoilers in saying that the two characters who hate each other will obviously end up friends at the end. That’s the standard, and slightly boring familiar formula here, and for what it is, it functions well. There’s also a clear metaphor being used throughout – that the puppets represent an oppressed minority who suffer frequent violence and death, and a nod to the Black Lives Matter movement – but it’s done with jest, so it’s not really taken as seriously as it deserves. Whilst not a comment on social movements, as such, one does feel that it could make more of a statement. Where The Happytime Murders excels is in its humour, because it’s very, very funny. But more than that, it’s filthy. Utterly, gloriously, unapologetically, deeply, darkly, sexually filthy. If you imagine some rude humour, and add some sexual content, and then multiply that by 50, you’ll still not be close to how utterly crude and dirty this film is. It’d be an X-rated film were it not for the filth being represented by puppets, and they get away with literal murder. 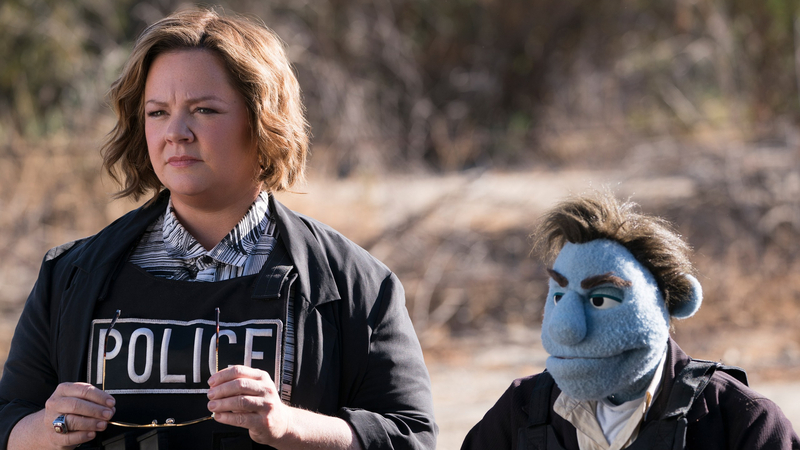 Many viewers will find The Happytime Murders vulgar, for sure, but for those who enjoy lewd adult jokes, this film is full of them. There are so many laugh-out-loud, and shocking moments, that it’s hard to care that the narrative is a bit thin. With homages to films like Basic Instinct, and behind-the-scenes shots in the closing credits showing the puppeteers working against green screens alongside the actors, it’s fun and silly, and great escapism if you’re likely to laugh at puppet-induced orgasms.